This support material is incorporated into critical challenges at grades 9 and 12, however, it can be adapted for use at all grade levels. 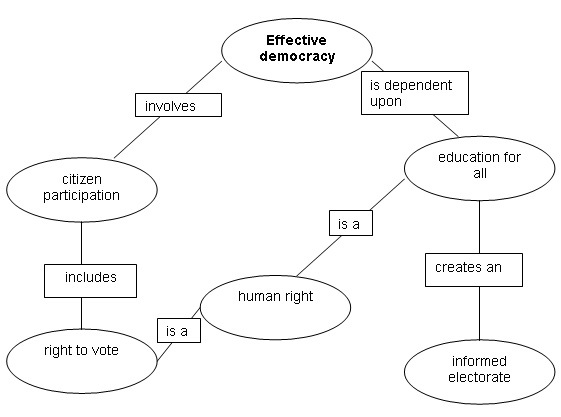 Concept maps can be used to represent relationships between ideas and concepts and to make causal connections. Typically, concept maps begin with the central concept at the top of the page and flow downward. Students make connections beginning with the central concept and related concepts. The essential difference between a mind map and a concept map is that a mind map clusters related ideas together and concept maps establish relationships between concepts. The connections in a concept map are made through verbs or verb phrases placed on the linking lines. The intent of a concept map is not to create a flow; it is to establish the relationships between terms and concepts. When properly constructed, a concept map clearly establishes the relationship between terms and allows viewers to see the connections between any two terms or concepts. As students become comfortable with creating concept maps, you may want to invite them to integrate relevant pictures or symbols to support their thinking.